It is our goal to transport the large base/sign for the lighthouse up to the site and install it on Friday. It's a tight deadline but I breathed a sigh of relief this morning when I discovered it was only Tuesday and not Wednesday as I thought. We will make it without a doubt - I think. :) But there is not a minute to lose. TJ and I worked at welding the final pencil rod structure to the upper portions of the feature while the rest of the team applied concrete and carved on four more posts for the fence. 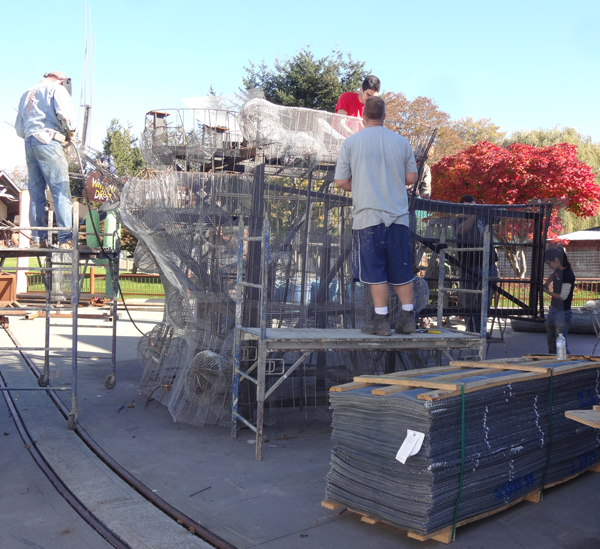 When the welding was complete, save for the tree, everyone switched to applying the galvanized lath. I continued to polish off the small welded tree. By first coffee tomorrow the piece should be wired and ready to be loaded onto the trailer. Then we can begin to apply the mud.